Kyo finally makes the decision to stop running from his fears and confront his birth father. But how will he react to his father's pressure to accept an unwanted truth? Meanwhile, as Akito's control over the Sohma family slips away, will the last vestiges of her sanity and reason slip away as well? (courtesy of Goodreads). 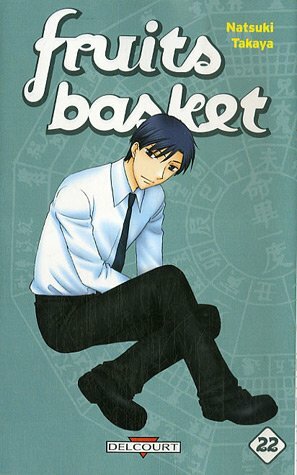 Following one of my least favorite volumes of Fruits Basket, we have Volume 22, which I think is my favorite volume. Kyo begins the volume by confronting his father, who is a hateful person, like all the adults in this story. Kyo essentially tells his dad that he's going to live his life the way he wants to. Then Kyo confronts Akito, and she essentially sets him free. His curse isn't lifted at this point, but she tells him that she won't confine him and makes plans to destroy the cat's isolation room. Tohru gets out of the hospital and Kyo finally gets to see her. Poor Tohru is convinced from their last conversation that Kyo doesn't want her. He has to work pretty hard to convince her otherwise. Meanwhile, they realize that Kyo's curse has lifted. They can safely embrace. Kyo breaks the beaded bracelet that was holding in the monster within. The curse lifts on all the Zodiac members at the end of the volume. It's heart-wrenching to see the sadness and loneliness that overtakes them. The Zodiac was a bond as much as it was a curse. None of them know how to live free and alone. I loved the facial expressions that Takaya drew. The best part of this volume is the very end, when the real story of the Zodiac is told. The one that all the cursed members had forgotten. The cat wasn't the foolish one at all in the real story. The cat was the smartest, the most loving, and the bravest. The others turned against the cat when they realized that it made the decision they should have. This volume was an emotional roller coaster. It pulls on the reader's heartstrings. But it's the best kind of emotional book - you go up and down, but end up feeling satisfied and positive. Good gosh, I loved this volume. Really, I loved this whole series. The last few volumes were the best, even through all the overdramatic and over-the-top stuff that happens. One more volume left for you! I think that watching Kyo pull apart his beads was my favourite moment in the series. Great review and I really like the cover of this one! This really sounds like a heart wrenching volume! This was a great volume, and you're nearly done! :D I hope you've enjoyed Fruits Basket even if it's coming to a close. Great Review. The ending of Fruits Basket was so bittersweet. I didn't want it to end.